Taking my chances on the autumn weather, I visited parts of the US Northeast and crossed the border into Canada for New Brunswick and Nova Scotia. Showing somewhat lesser dedication this year for tracking aviation history, in part due to the fact there are much more vintage 'dead planes' then live planes' in this part of the world, I did find some classic aircraft on my route and some were every much 'alive'!. registered since 17Aug98 to George B. Courtney, Center Harbor,NH. In 2009 I did a similar 'US-Can' trip and had hoped to visit Moosehead Lake then, but found it too much of a detour. This year there was no escaping and I planned it in the very first few days of our two week trip. That is how we ended up in Greenville Junction on Sep.19th and visited Currier's Flying Service first thing. 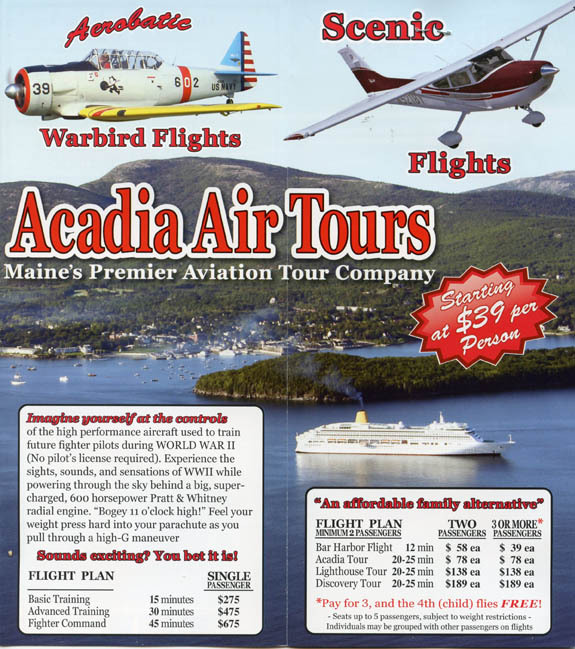 The weather is a fickle phenomenon here, high up in Maine, and since we already had three days of the most glorious sunny weather I took no chance and made inquiries for an 'asap' flight in the Cessna Ce.195. I accepted the minimum charge for three people and since the other Ce.195 down at the dock needed another thirty minutes of routine maintenance, I had a walk around see what alse was to be found. Cessna 195 N3488V (c/n 7193, since 1998 registered to Currier's Flying Service; manufactured in 1948.
seems to have some decorations added; but what else can you expect on Moosehead Lake? Our contract for 40 minutes of flightseeing! Avgas is getting more rare and more expensive; on the other hand I haven't heard of anything becoming cheaper..
DHC-2 Beaver N91549 (c/n 628, Reg. 1987, MFR 1958) is being moved along the dock to make space for our departure. Roger moved N4666U too, a 1964 Cessna 180G on Edo 2870 floats. It has c/n 18051366, was registered to him in 1983 and its manufacturing date is 1964. The maintenance check Roger had been working on was completed with an engine testrun. The engine ran beautiful, stationary for some ten minutes, without a splutter or hick up. 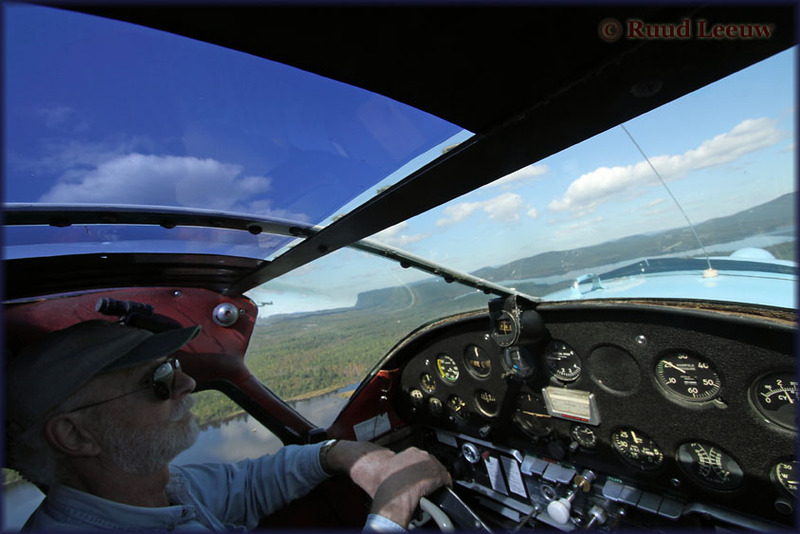 It is easy to see what limited forward visibility the pilot has in the Cessna 195. The Cessna 195 N145V (c/n 7135) was built in 1948 and has been registered for Currier's Flying Service since 1986. Well, talking about limited forward visibility: this isn't half bad, eh? allows communication in the cockpit without wearing a headset or yelling on top of your voice. Forty minutes is short, but it was fun; soon Roger was calling in and turning for an approach into 'homeplate'. 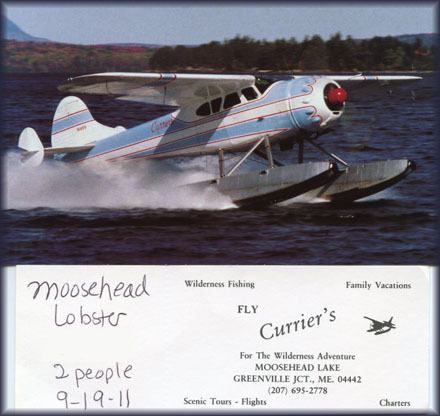 Currier's Flying Service seaplane base in Greenville Junction,ME. After landing it was awesome to see how Roger timed the cutting of the engine and floating to the dock, turning 180 degrees! the motel almost next door. The DHC-2 and the Ce.180 did a few more trips and we had a good view from the motel's lawn. Serenely floating by, towards the dock. ... and soon floating back to base. We had set foot (or actually driven the car from the ferry) at Digby, Nova Scotia and found ourselves driving to Halifax, when I noticed the sign for Greenwood and remembered from Bob Ogden's book on aviation museums that such an institution existed there. Date of visit 22Sep2011. SEE MY REPORT! 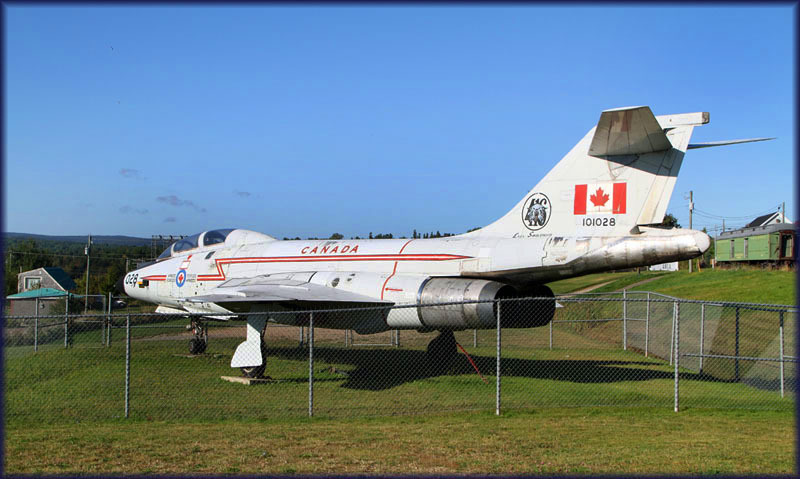 Shearwater Aviation Museum is near Halifax, about 5 kms south east of Dartmouth. On 18Aug1918 (!) the United States Navy (!) set up a flying boat station at Baker's Point in Dartmouth; this area is part of the current base. 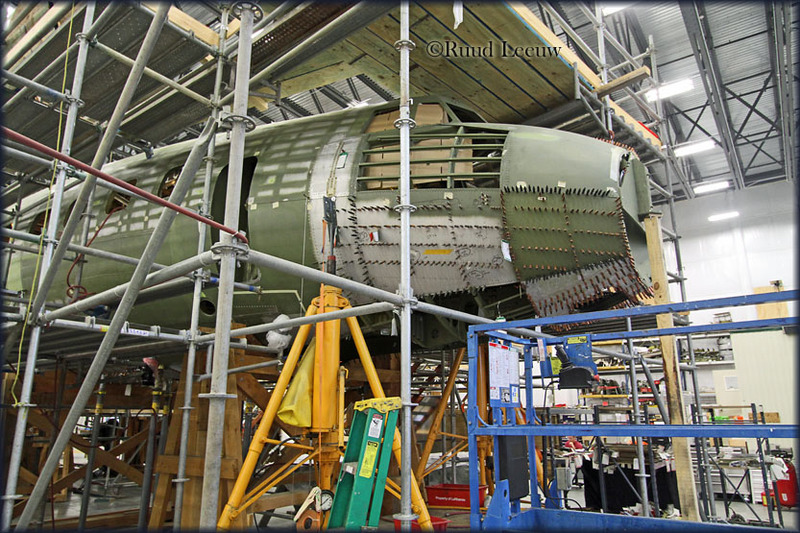 A report of my visit can be found HERE..
Next we visited the Atlantic Canada Aviation Museum, which is located quite a bit outside Halifax, on the international airport. McDonnell F-101B-90-MC Voodoo (USAF batch 57-343/346), 57-346 to Canadian Armed Forces as 101028 in 1970/71. To instructional airframe as 831B 13Aug1984. Struck off Charge (SOC) 10Apr92. Now on display at Preservation Park, Hillsborougn, NB as 101028. (Source Joe Baugher's website, USAF serials). The aircraft sits alongside the New Brunswick Railway Museum, which is a museum dedicated to the guided ground transportation of New Brunswick and operated by a group of dedicated volunteers. The museum opened in 1993 and is visible from the main road, Route 114, through Hillsborough. Don't know their relation to this preserved aircraft or whether other parties are involved, it is the only aircraft on site here. We soon crossed the border into the United States again. Outide Bar Harbor we noticed the sign for 'flightseeing' in a biplane and I decided to have a look. 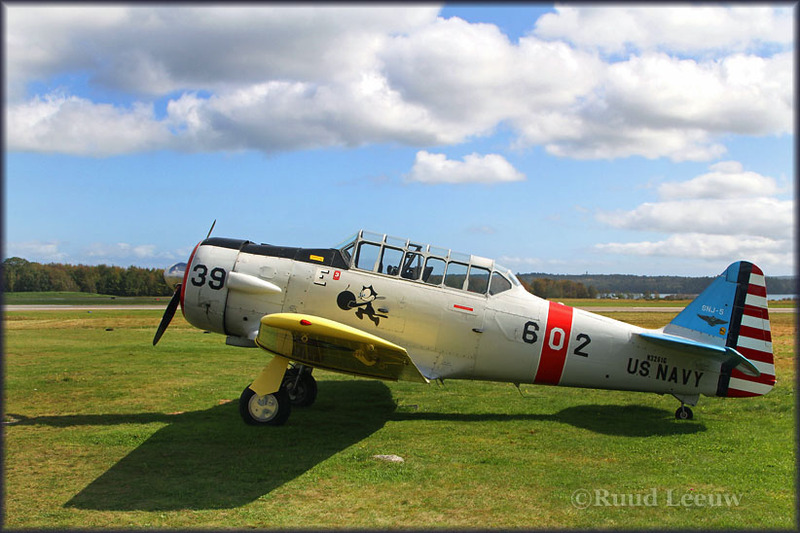 The biplane was in maintenance but instead I 'found' this SNJ-5 (N3261G) warbird! Unfortunately my budget was running low and my itinerary for the day did not allow the break. How regrettable! From the FFA's website I learned that North American SNJ-5 has serial 90612 and was manufactured in 1946. It has been registered to Felix LLC on 13Oct2011 (Wilmington,DE adress), so I was too late to find what it was registered on the date I visited, Sep. 28th. Was it sold after my visit..? By googling I found it may have been owned by Robert L. Chisholm of Memphis,TN, possibly for the period 1965 - 2006. More information welcomed (please quote the url in your email). The Deperdussin Monocoque was an early aircraft built in 1912 by the Société Pour les Appareils Deperdussin, commonly abbreviated "SPAD". Designed as a racing aircraft, it was a single-seated monoplane with a streamlined shape. The next day we enjoyed an upgrade by Delta Airlines, to business class, and flew from Boston home in style. Thank you Delta!